The Yellow Swarming Fly (Thaumatomya notata): Smaller than the housefly, yellowish body with black markings, commonly confused with the fruit fly. Cluster flies are commonly occurring throughout the UK, with Pollentia rudis being the most common clustering fly found in homes; however, mixed populations of flies can also be found. Cluster flies and autumn flies are most prevalent in the countryside as they lay their eggs in damp soil and dung, respectively. In rural or semi-rural locations cluster fly infestations are a particular nuisance as they tend to recur year on year. You would first tend to notice cluster flies when they buzz around windows on warm, sunny days. As temperatures begin to drop in late autumn, typically between September and November, cluster flies seek out warm places to hide and will begin to migrate into houses and farm buildings for protection against the elements as they hibernate over the winter. Cluster flies can gain entry through the smallest gaps under eaves, between air bricks and roof tiles, so are almost impossible to keep out. They will often be found in colonies of hundreds up to several thousands. As they tend to favour lofts and roof spaces they are also known as ‘attic flies’ or ‘loft flies’. Cluster flies are not damaging to properties, however they can produce a sickly smell while hibernating and can often be unsightly, with fibre glass insulation covered in bodies of flies. Light diffusers or sunken spot light lenses can become full of dead flies which is often the case in converted loft spaces, and should their local environment become warmer they can emerge to fly around, being attracted to light they can often make their way through light fittings into living areas. Although it is common to be able to locate a hibernating colony, many buildings built after 1950 have an external roof covering with an under felt layer, flies can hibernate undetected between these two layers. Cluster flies are field insects, and can often been seen basking in sunny grassland or resting on southern facing surfaces in the warmer months. Adult flies lay their eggs in damp soil in permanent areas of grassland such as grazed pasture or parkland, fields which are regularly used for crops are less likely habitats due to the soil cultivation practices, such as ploughing, disrupting the flies breeding cycle. As the temperatures increase the eggs will hatch, the larval stage is parasitic and will bore through the body walls of earthworms and feed upon then until they pupate and emerge as adult flies. Adult flies will feed on nectar from wild and garden flowers as well as decaying vegetation. The life cycle of clustering flies is dependent upon the prevailing weather conditions, two generations per year are most common, however in hot summers up to four generations per year is a possibility. A carefully designed and selected bundle of the market's leading cluster fly products from Pest Expert. 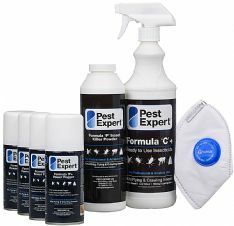 This kit includes Formula ‘P’ Cluster Fly Foggers, Formula ‘C’ Cluster Fly Spray and Formula ‘P’ Cluster Fly Powder giving you a potent combination of insecticides for fast knockdown and long-term protection, ensuring that your home or business remains free of cluster flies. 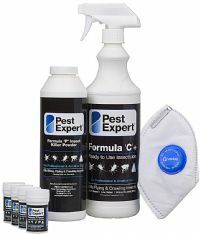 Pest Expert Formula ‘C’ Cluster Fly Spray is a highly effective cluster fly killer, containing a long lasting residual insecticide which will maintain its rapid knockdown effect for up to 3 months. Formula ‘C’ is non-staining, solvent free and low odour making it perfect for use in homes with children and/or pets. Perfect for application to alighting surfaces, window frames and roof timbers. 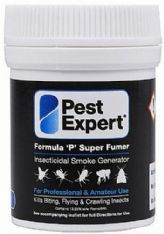 A 5ltr container will treat and area up to 100 sq m.
Pest Expert Formula ‘P’ Cluster Fly Smoke Bombs are a powerful and highly effective fumigation device, containing the potent insecticide permethrin. These smoke bombs are a vital component for any cluster fly treatment and offer rapid knockdown to cluster fly populations in loft spaces or rooms. 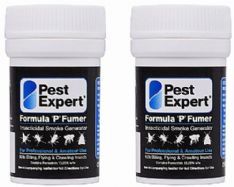 Pest Expert Formula ‘P’ Super Fumer Cluster Fly Smoke Bombs offer rapid eradication of cluster fly colonies present at the time of treatment. The Super Fumers are a highly effective fumigation device, treating an area three times as large as a standard bomb. Each Super Fumer contains the potent insecticide permethrin, offering quick and effective results in the larger loft or roof space. The Pest Expert Formula ‘P+’ XL Cluster Fly Fogger is a powerful super-sized fly killing fumigation aerosol (ULV) canister containing over three times the amount of potent insecticide as the standard Fogger. Each canister will release an insecticidal gas which will rapidly eradicate all cluster flies present during the time of treatment. Designed for larger roof spaces, lofts or open plan living areas. 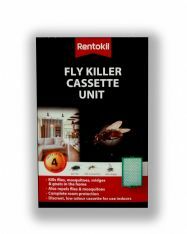 Rentokil Fly Killer Cassettes offer long lasting knockdown. The formulation of transfluthrin will help maintain control for up to 3 months. Discreet and easy-to-use, these Fly Killer Cassettes are a powerful addition to any cluster fly treatment. This is a top quality safety mask that meets the EN149 European respiratory standards, offering unparalleled user airway protection when carrying out a cluster fly treatment.